1. Awaken Our Hearts: Invigorating the Family of Faith: from Baptism to Table, from Table to World!" FOCUS: Renewal, Impassioned Believing. Awaken Our Hearts serves as an excellent jump-start or amplifying agent for "Christ Renews His Parish," "Renew" or a similar ongoing parish program. 2. Go Into the World: "Enriching the Family of God in Faith with Hope for Love!" FOCUS: Through music, story, song and gospel preaching and a thoughtful incorporation of Baptism, Reconciliation and Eucharist, Fr. Ken brings us on a joyful journey from doubt to faith, despair to hope and desolation to love. This is a powerful mission for young and old alike. 3. Blessed are the Merciful: Seizing the opportunities for Mercy: in the family, the parish and the world! FOCUS: Perfect during the Jubilee Year, but also appropriate for a parish needing healing and unity, this mission highlights foundational biblical texts and celebrates the compassion and love of God for all in Word and Sacrament. 4. The Joy of Love: Honoring the dignity of persons while affirming the sacrament of marriage and the importance of family. 5. Future Full of Hope: Giving life to the legacy of our believing, from generation to generation. Instilling the Vision of God for the Family of Faith, called anew to Baptism, nurtured at the Table, and sent as hope into the World! FOCUS: Believing as a Family; Building, Feeding and Teaching an enlivened faith - from Parent to Child, through shared prayer and action. Future Full of Hope serves as an excellent companion program for parishes that are building, merging and/or growing. 6. I Have Called You by Name: Mobilizing the Family of faith - Eucharist must be lived! FOCUS: Embracing and living the call of Baptism. BAPTISM CALLS EACH AND ALL OF US to a conscious and active role in the Mystical Body of Christ. Faith is not a spectator event, parish is not meant for passive membership. Belonging to Christ carries gifts beyond measure, and real responsibilities that impact the lives of all those who surround us, especially our children, and even our children's children. I Have Called You By Name serves as an excellent conduit for parish participation programs, i.e. talent/time campaigns or other mobilization efforts. FOCUS: Sacrament; Journey of Believing: Word Proclaimed, Received and Shared. As Streams in the Desert serves as powerful celebration of the true incarnation theology of our church. This mission is a stunning reminder of using our Baptism to identify purpose, live meaningful priorities, and recognize that our only reality is Christ. An outline of a 5-day mission. The Mission Presenter offers a reflection on the scriptures of the day, and begins to plant the seed of what will become the theme for the entire mission. The music minister also plays and sings during the Preparation of the Gifts and, sometimes, at Communion. Following the Prayer after Communion, the Mission Presenter will make a logistics announcement concerning the schedule of the mission. This announcement will be kept separate from the Reflection on the Scriptures of the day. The concert is a beautiful and uplifting gathering which lights the flame of hope, excitement and anticipation of the days to come. All AGES are invited to participate, and the parish is encouraged to involve all organizations and ministries as volunteers and participants - from children to teens to young adults to adults to seniors. This night becomes an attractive and non-threatening portal through which everyone enters the Monday through Wednesday evenings, and invites others to do the same. Monday's is a compelling and profoundly beautiful service of light and darkness, calling to mind the gift and call of Baptism. This day features sacramental Reconciliation, celebrating the gift of spiritual freedom and new life. All events will be held in the church. This sacred space creates an environment of rich and vibrant spirituality. The optimal time for a concert and mission is at 7:00 PM. This will allow young families to bring children of all ages, permit families to finish dinners and other activities, and is an attractive time for adults and elderly. It is important to involve the teens, youth, adults and seniors of your parish to help with distributing materials and songbooks, taking up offerings, directing parking if necessary, set up of equipment, hospitality at reception, and clean up at the conclusion of the Parish Family Concert. The more involved folks become, the more enthused they will be, the richer and more meaningful the experience for all who come. Most effective is the use of good publicity and promotion. 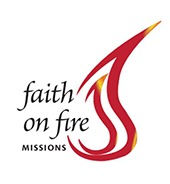 Faith on Fire Missions can assist you by sending promotional aid ideas for inclusion in the bulletin or as banner ads to advertise for the mission. Faith on Fire Missions maintains several sets of equipment and materials in different sectors of the country. If one of those sets is nearby, we would ask for your generous assistance in sending a parish custodian or volunteer to pick up the materials. Otherwise, Faith on Fire Missions ships them to the church and asks that the parish provide safe, climate-controlled storage. Faith on Fire Missions will use the sound system equipment and digital piano that is shipped, unless the parish has a well-tuned grand or baby grand piano that can be moved to the center of the church.